The brutalization of terrorism.. 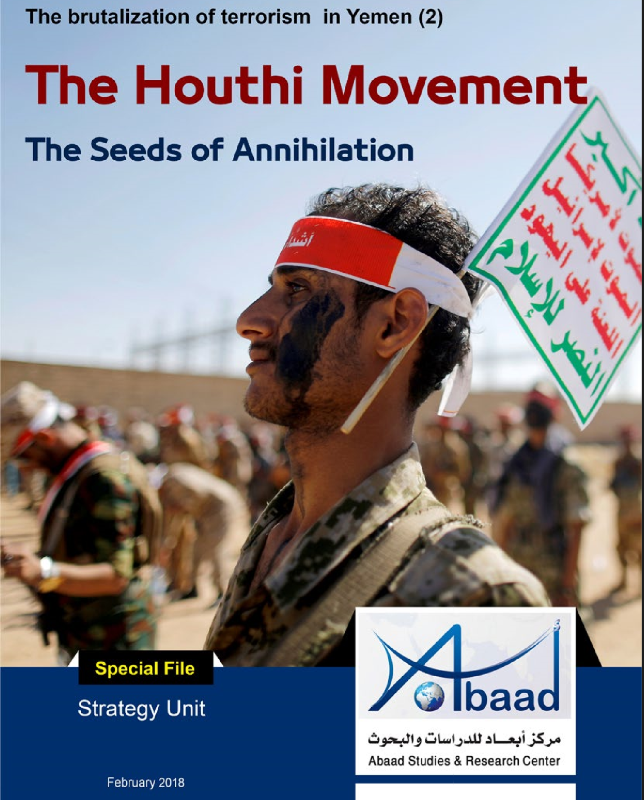 The Houthi Movement - The Seeds of Annihilation (2) is the second section of the Abaad Studies and Researches Center’s release, which monitors groups of violence and weapons in Yemen and focuses on the Houthi movement, which suddenly emerged in 2004 and with arms it has reached to power only within a decade. The first section dealt with al-Qaeda, Daesh (IS) and the fragile war on terrorism. Al-Houthi movement is based on a dual force that combines the historical legacy of the parallel regime of the republic known as "the political Hashemite" with the revolutionary Houthi movement whose ideology and methodology are derived from the Iranian Shiite ideology, and it is being supervised and trained by the Iranian Revolutionary Guards. This file is divided into two parts: the first is a political and military study of the Houthi group and its ability to adapt in light of the current situation, and factors of its steadfastness and its ability to mobilize and coordinate the military action as well as the links of the movement regionally and its effects in the regional and international policies. This study presents the path of violence of the armed group and the cost of the coup. The second part focuses on ideological aspects and the doctrinal and sectarian methodology, which were a means of control and governance under several crossing projects between a group that dreams of regaining the Imamate rule before 1962, by what is known as the political Hashemite, and an armed Houthi revolutionary movement, which is floated by Iran, and is working on the establishment of a permanent geographical scope that threatens the Gulf neighborhood. The first part (Cost of the coup.. Postponed Reprisal) talks about the price that the Yemenis pay due to the coup and the daily bloodshed. The study examines the civilian casualties killed by Houthi in 2017 and held a comparison with the victims of 2016, bringing to an approximate number of the total civilian deaths that were killed since the coup on 21 September 2014 until the end of 2017. The file concludes that the bloodshed targeted the social fabric and is expected to generate strife and revenge. It addresses the scenarios of either the defeat of the Houthi movement as a result of a coalition against it or the continuation of chaos and bloodshed while the movement remains in control of areas in the north making them a state that extends from south of the capital Sana'a to Saada, on the Yemeni - Saudi border. The second chapter deals with the paths of the Houthi movement from the social, ideological, and military aspects under the title "The Paths of the Houthi Movement, the Seeds of Collapse." The study argues that the emergence of the group with its ideology and bloody pathways that targeted Yemen and its social and political structures, its crude violations, its adoption of the idea of Imamate, the exploitation of the Peaceful Youth Revolution and the failure of attempts to urbanize the movement will bring it to its inevitable end. The file also talks about Iran that intervened in Yemen as a strategic player through the Houthi movement and formed a smart strategy based on plans to break up and penetrate into the Yemeni society, weaken the morale of the military forces and penetrate them, gradually expand on the ground in each war, and possess the military arms and soldiers to form an organized militia. The paper presents four scenarios for the end of the Houthi movement and its possible annihilation. The third chapter (Stations of Houthi violence ... Houthi on the way to the end) tries to list the stages of the emergence of the Houthi movement and its relationship with Iran in its beginnings, in addition to the association of the armed group with the outdated heritage of the political Hashemite that believes in the limitation of the rule to the offspring of Hassan and Hussein. The file talks about the group's reliance on violence against the state and the beginning of the insurgency and how Houthis based on it. The paper also refers to the six wars fought by the group and the paths it chose after the Popular Youth Revolution, and how it reached from the rugged Maran Mountains to the capital Sana'a, and how Houthis invaded the capital. The paper monitors the relationship between the Houthis and the regime of former president Ali Abdullah Saleh. The study goes on to discuss the paths chosen by the Houthi group during the military operations after March 2015 and so far, to monitor, at the end of the paper, the scenarios of the group on the way to its end. The fourth chapter (Terror of Iranian weapons.. power threatens the Gulf security) deals with the Iranian weapon, a threat to the security of the Gulf. It provides accurate monitoring of the Houthis' weapons, its ability to target the national security of the Arabian Peninsula, and the Gulf states that stand alongside the internationally recognized government within the Arab Coalition. The study also links the missile and naval forces of the armed group to the quality of Iranian weapons and provides an approach to those weapons through the form, range, target, launch method and size. It finds out that there is a big similarity between these weapons and the group's missile force and booby-trapped boats. The study talks about the future of the Houthi missile force and how it reached their hands. Can Iran really be able to smuggle ballistic missiles? As the opponents of the group say, or is it already the development of local industry?! The fifth study is titled (The killing of Saleh.. Neutralizing Russia and lifting the cover of the Houthis .. America seeks to defeat Iran in Yemen). It focuses on the international transformations towards the Houthis from the beginning of the war until the killing of the former president Ali Abdullah Saleh, and the key factors behind the transformations: the increasing humanitarian crisis in the country, targeting Saudi Arabia with missiles that reached in Riyadh, the state of discontent with Iran, and the brutal killing of the former Yemeni president (according to the American expression). The paper focuses on the shift in the American and Russian politics, where US policy has undergone a dramatic shift since the new administration came to the White House. Yemen was the scene of the US shift in the Middle East. In 2017, Washington committed itself to supporting its allies and restoring relations that were affected during Obama’s administration. The visit of James Mattis (US Secretary of Defense) to Riyadh in April 2017 and the US evidence of Iran's involvement in arming the Houthis in a military base outside Washington (December 2017) highlighted the above-mentioned shifts against Iran and the Houthis. The United States has failed to convince the group of its plan, and the killing of former Yemeni President Ali Abdullah Saleh has affected Russia as well so it transferred its mission to Riyadh, which means less restriction on US efforts in supporting its orientation in Yemen. According to the study, President Trump wants to achieve his electoral program through Yemen: Stopping Iranian tools, fighting al-Qaeda, restoring stability in the Middle East, stopping the deterioration of the humanitarian situation; restoring old allies' confidence including the Gulf countries after being affected; these gains will not cost America so much. The second part of the file focuses on the intellectual and doctrinal aspects. The chapter 6 of the study (Hadawiya and Houthiya, Imamate in the offspring of Hassan and Hussein - Al-Batnin) focuses upon the heritage of the Houthi movement and asserts that it is a revival of the "brutal" practices of the imams during their rule in Yemen for centuries before the fall of the Imamate in in September 1962. The study reviews the historical vision and reads the events associated with Zaidiya and the doctrine of Imam Zaid and its differences with the political Hashemite. The study details the Hadawiya imamate in Yemen and its connection with the theory that imams should be from the offspring of Imam Ali bin Abi Talib, and how this affected the methodology of the Houthi movement and its development and paths. Chapter Seven (The Parallel Entities of the State, the illusions of sectarian Emirates in Yemen), which concludes that any future political settlement that ensures the survival of any Houthi parallel military and administrative entity within the future Yemeni state will bear the seeds of its failure and restore the state of war in any crisis. It also concludes that the restoration of lasting peace in Yemen necessitates the compelling of the Houthi movement to integrate into the political society and to abandon its ideological fascism, the project of imposing sectarian militarism on the society by force and the illusion of building sectarian states and parallel entities. It goes on to point out that the survival of any sectarian entity, parallel to the state, in any part of Yemen, will stimulate other emirates and doctrinal entities in other regions and that will impose threats against the internal, regional and international security. Previewing the historical background of the Zaidi- Salafi conflict in Saada, the study proves the absence of the fundamental relationship between the old conflict between imams and Wahhabiya and the new conflict. Chapter 8 (The Revolutionary Houthi movement and the political Hashemite.. Alliance of Governance and Struggle for Survival) tries to analyze the relationship that linked the armed Houthi group in Yemen and the political Hashemite to take power after the end of the Imamate regime that ruled the northern governorates of Yemen for centuries until the establishment of the republican regime in 1962, and how the group relied on this legacy to get supporters and keep the idea that encourages the group to stay and continue in power, and the association of that with the beginnings of the group and its probable fall, and who will throw the other from board of the ship for survival.